Left to right: Jake Pulman, David Duignan, Ella Cummings, Abbie Glinn, Catherine Hiscox. With more than 100 staff based in its regional HQ in Exeter, and developments in locations like Cranbrook, Ottery St Mary, Dawlish and Teignmouth, Bovis Homes is firmly establishing itself in the South West. It comes less than three years after opening up its first Exeter office with a staff of just six. Councillor Rosie Denham, Lead Councillor for Economy and Culture, Exeter City Council said: "Bovis Homes have been through an impressive period of growth since opening their Exeter office and have played a major part in the delivery of Cranbrook. 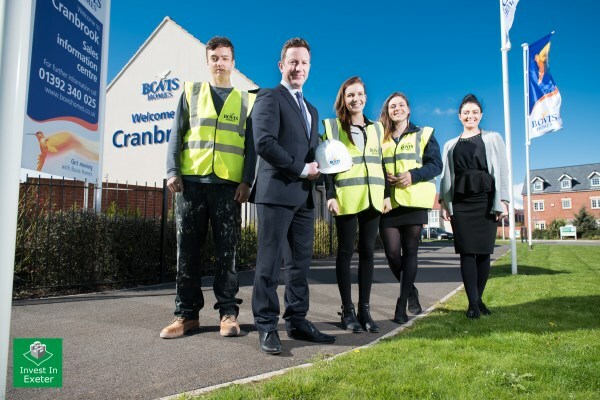 "Their commitment to the area and promise to take on, train and support more apprentices is absolutely fantastic. The firm is already a large employer in the area, so it's fantastic to see that they will continue to grow their Exeter team, providing excellent opportunities for anyone looking to go into the industry." Amongst the small team of six who originally made the move to Exeter in 2013 was Managing Director David Farley, who remembered: "With the economy and outlook improving it was time for us to be in amongst the growth and talent that is here and make a name for ourselves in the South West. "Since the move, we have grown rapidly but have had a strategic plan in place from day one to ensure we took on the right staff at the right time. Like most businesses, our success is built on the quality of the people and we have developed a team which is exceptionally talented and creative, which is the fundamental reason why we have become a genuine force in the area. "We seek to be the employer of choice by creating an environment in which people can develop and thrive and, above all, enjoy coming to work and being part of a successful team. Many of our current team joined us when we started out and have been promoted to better positions, thus genuinely sharing in the success. We continue to recruit and have a high staff retention rate."